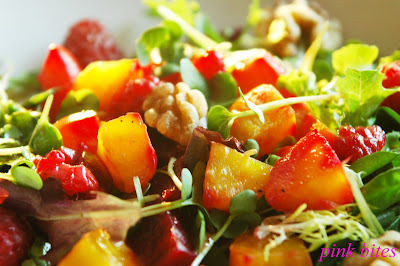 This salad is my own creation and it is inspired by a similar one I ordered at a waterfront restaurant here in Seattle. I really like the combination of the beets with the raspberries. 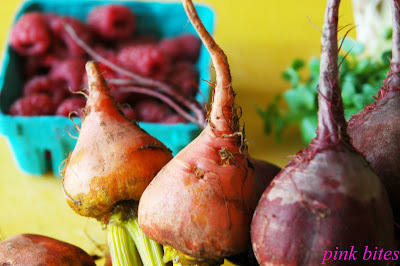 At this time of the year (summer), the farmer markets have plenty of both kinds of beets, golden and purple. The golden one is my favourite. Place beets in a foil package, drizzle with 2 tablespoons of olive oil and season with salt and pepper. Close package and roast beets at a 375 degrees F oven until tender, about 1 hour. When beets are cool enough to handle, peel them and cut in 1 inch squares. Set aside. In a jar add vinegar or lime juice, remaining 3 tablespoons of olive, Dijon mustard and a squirt of honey. Season with salt and pepper. Add a couple of raspberries and lightly crush them with a spoon. Close the lid and shake jar until dressing is all blended. To assemble the salad, make a bed of greens, place beets on top and pour dressing. 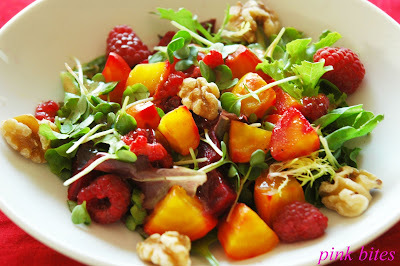 Top with walnuts and extra raspberries.